America's News Media Alliance has followed up its 'real news' campaign with advertisements arguing for accountability by politicians. 'No Questions = No Answers; No questions from journalists = less accountability in our democracy,' is the slogan on the advertisements, offered to newspapers in whole page print, digital and other formats. 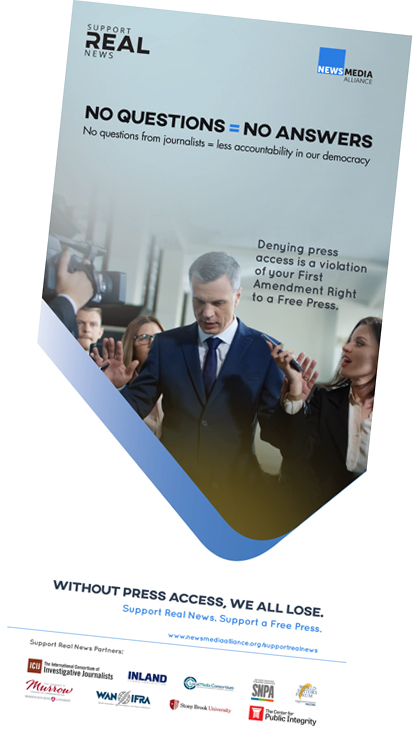 "Denying press access is a violation of your First Amendment right to a free press. Without press access, we all lose. Support Real News. Support a Free Press," the advertisements continue. Formats include the print ad (pictured) in full and quarter-page sizes, as well as digital banner and cube JPEGs, for use in print and online newspapers. They can be customised with newspaper names and logos.